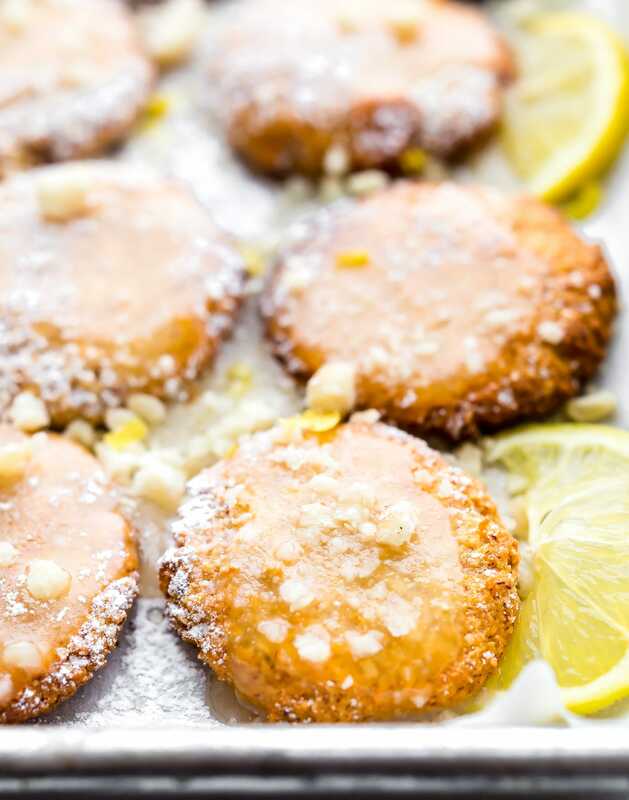 These Zesty Lemon Macadamia Nut Cookies have a wonderful flavor combination of coconut, lemon, and buttery macadamia nuts! Chewy in the middle. Crispy outside and topped with a simple lemon glaze! So good and easy to make! Paleo and Vegan Friendly. 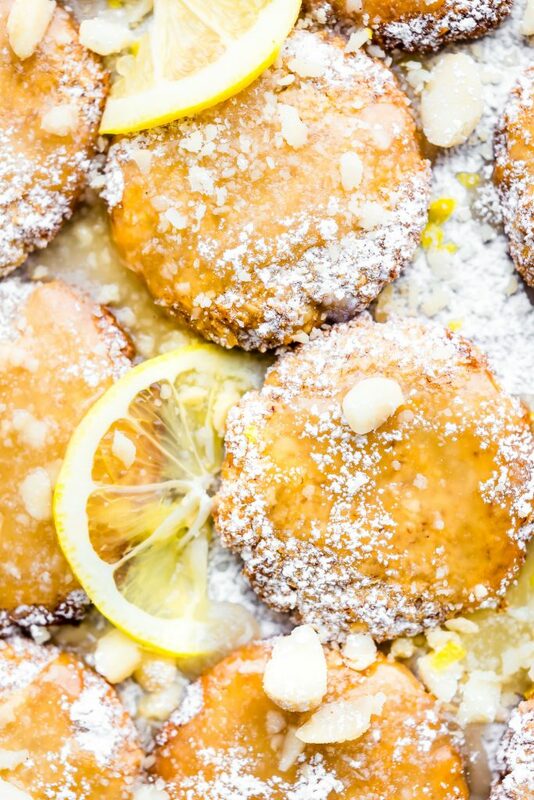 I had full intentions of calling these Lemon macadamia Nut cookies something else. 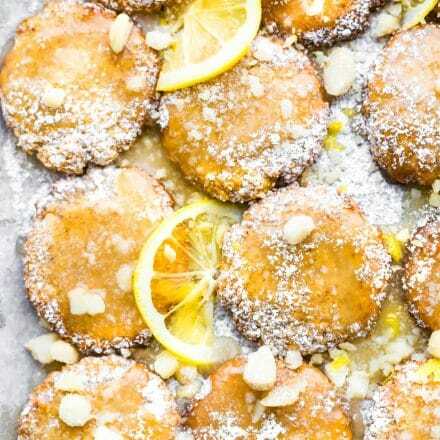 Like say, delectable lemony glazed mac nut cookies that are TO DIE FOR! But I figured that was a mouthful. Although that’s exactly what they are. Gah.. a mouthful of delectable lemony melt in your mouth flavor. 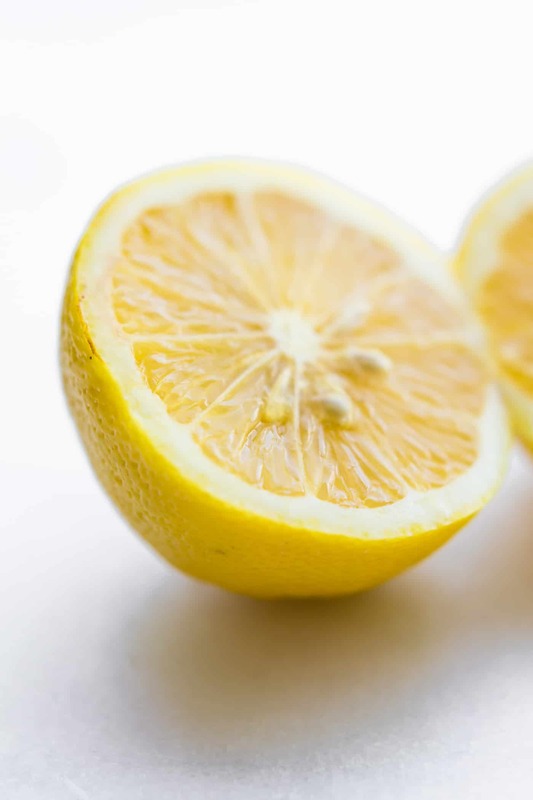 Perfectly zesty and sweet! And I’m giving myself mad prop for making them paleo and vegan friendly. Which was… uh… an experiment. Luckily, I figured it out so that you don’t have to. Nope. You can sit back and rest assured these are EASY to make and … wait for it… DELECTABLE. In all seriousness, I am not a world class baker. But as mentioned last week, there’s something about Spring that makes me want to bake lighter cakes, breads, and cookies. Citrusy fruity flavors and crispy texture. 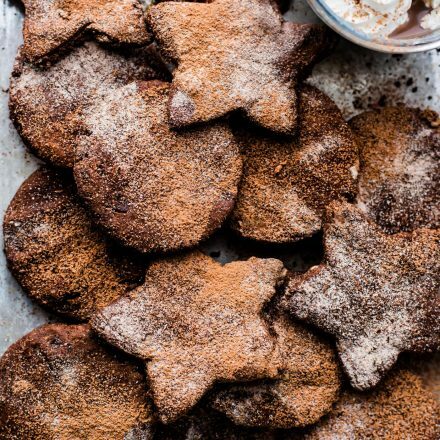 I mean, who doesn’t love a good shortbread-ish cookie recipe? To go with tea of course. I could go on and on about my nerdy science techniques for baking these Lemon Macadamia Nut Cookies, but I will spare your brain cells. Instead, can we chat about the first word of the title? Zesty. Why yes, zesty does describe the Lemony flavor part of the Macadamia Nut Cookies. But zesty also means that something else. Zesty (according to vocabulary.com) can be defined as a marked by spirited enjoyment! Don’t you just love that?! I don’t know about you, but after a long winter, I ready for a little spirit of enjoyment. 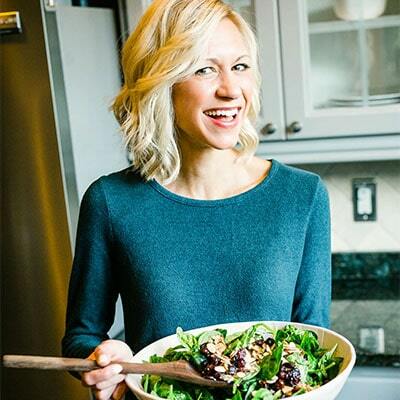 Wether is be with baking in the kitchen, feeding friends and family with healthy gluten-free recipes, or just actually STOPPING work to live more and unclutter the mind. This past month has been a wake up call. So much life right in front of me (us) and yet we like to suffer. Meaning, we take on more and more and more and pretty soon we are left without any ZEST of life. See where I am going with this? Probably not. Haha! 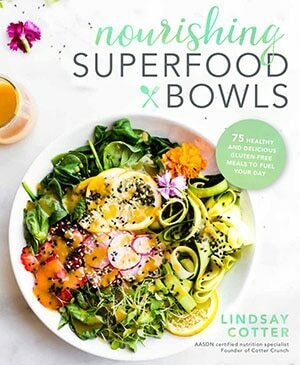 My intentions are to keep this site, my recipes, and my focus full of HEALTH and LIFE. But if I am not taking my own advice here, then how can I fulfill that focus? I can’t. Be prepared for less is more these next few months. 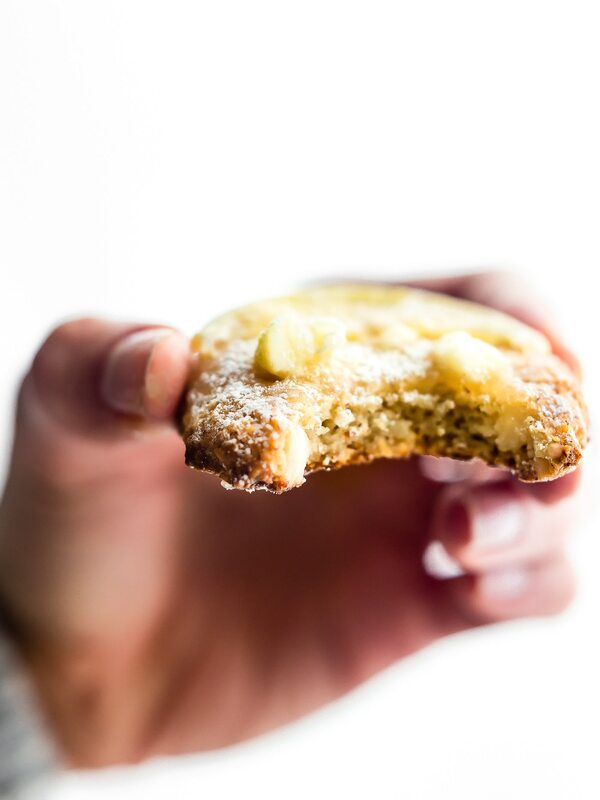 I am bringing back the ZEST of life this season with Lemony Macadamia Nut Cookies. Just to remind you, to remind me, that when you got something good right in front of you… ENJOY it! Take time to savor it! Get out of the more is more mindset. Because when life hands you lemons, you make macadamia nut cookies. Okay, again, another Corny Cotter moment to segue into COOOOOOKIES! These Zesty Lemon Macadamia Nut Cookies are truly easy to make. 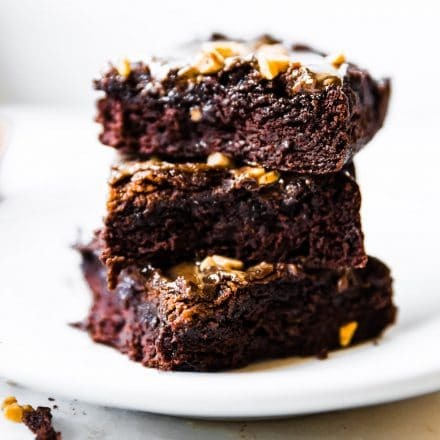 Paleo friendly and vegan friendly so that every –> one –>–> can –> enjoy! Uh, unless you have a nut allergy. Oops. 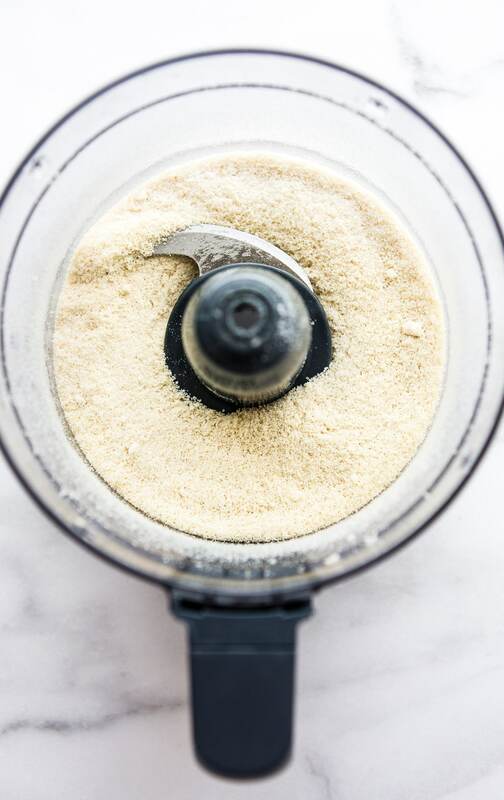 Grind up some buttery macadamia nuts. Add a wee bit of coconut. And a whole lotta ZEST. Oh and don’t forget the lemony GLAZE with crushed macadamia nut topping! 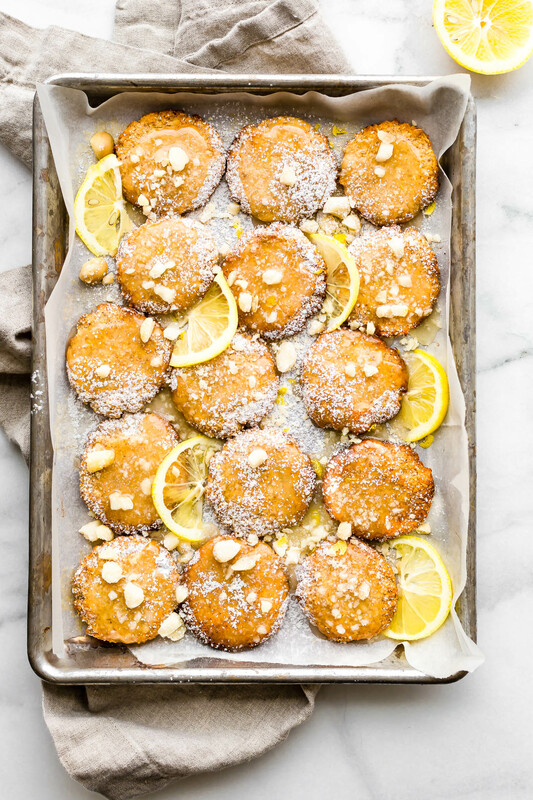 These Lemony Macadamia Nut Cookies are packed with sweet coconut and crunchy macadamia nuts. Perfect with a cup of coffee! Gluten Free, Dairy Free, Paleo friendly, and Vegan. Blend banana until pureed, place into a mixing bowl. Pulse macadamia nuts in Food Processor until ground. See picture in post. In a separate bowl, mix your dry ingredients (ground mac nuts, flour, spices, baking soda, coconut, salt). Mix maple syrup in with the pureed banana then add to the dry ingredients bowl. Add your extract and lemon zest. Mix again. Let the dough chill 30 minutes or more in fridge. Preheat oven 350F and grease a cookie sheet or line with parchment paper. Parchment works best. Roll the dough into balls that are golf ball sized then place on cookie sheet. Press each dough ball down flat with palm or back of a spoon. Bake for 15-18 minutes for crispy or Bake 12-15 minutes for more chewy texture. For the glaze, mix your maple syrup, coconut oil, and lemon together in small bowl. Brush onto cookies. A a few very thin lemon slices to any or all cookies. Sprinkle with crush macadamia nuts and powered sugar or sugar free powdered sugar . Store in air tight container for a week or so. They keep well in fridge for longer if desired. 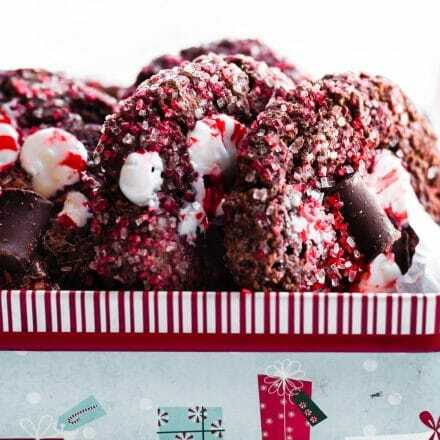 What’s your favorite cookie to make these days? Name one thing can you do NOW to bring more ZEST in your life! P.s I have a huge project coming up the next 3 months. Can’t wait to share. But in the meantime, will someone please remind me to take my own advice? Have a cookie and sit back and relax from time to time, yea! Have a zesty cookie, sit back and relax. But make your own batch, these are for me. Take your own advice! Now tell me to do the same! SIT BACK AND RELAX!!!! 😉 i usually only make chocolate chip or sugar cookies… these look light and delicious! Lemon cookies are perfect for spring and I feel like macadamia nuts are always neglected for some reason? But they’re so good! I know! i think it’s because they are $$. Le sigh.. These sound amazing! Zesty really adds to the flavor effect. I used to eat macadamia nut pancaks growing up- those bring me back! yea! let’s bring back the mac nuts!! so so neglected yet good! I don’t use macadamia nuts enough. They’re one of my favorites! I also hardly ever make something dessert-y with lemon… yet I love that too. Cleanly the universe it telling me I need these cookies. P.S. Can’t wait to hear about the project! Will share once I’m finished with 70 more recipes in 2 months. Need help! Wanna come be photo shooting assistant? I send you some! or come visit! I wish I could visit you!!!! No $$ for anything but bills – and my treat cookies on the weekend of course. 🙂 xoxoxoxoxox Excited to hear about this upcoming thing you are doping! Oh, I need these cookies! As soon as I saw the photo on my Bloglovin feed I knew it was your handywork! Can’t wait to try! yay! keep me posted Gretchen! You gotta try it casey! oh yea! zesty needs to happen when you eat cookies. LOL! Zesty is what summer is ALL ABOUT! I mean, we’re talking about flavorful, fruity, spicy, savory, and sweet-sweet-sweet new dishes coming to the table. But honestly, you do you, dear! I know that it’s been stressful, so if you need to take the blog to another angle, then I will support you no matter what! I’m stoked to see what there is to come! 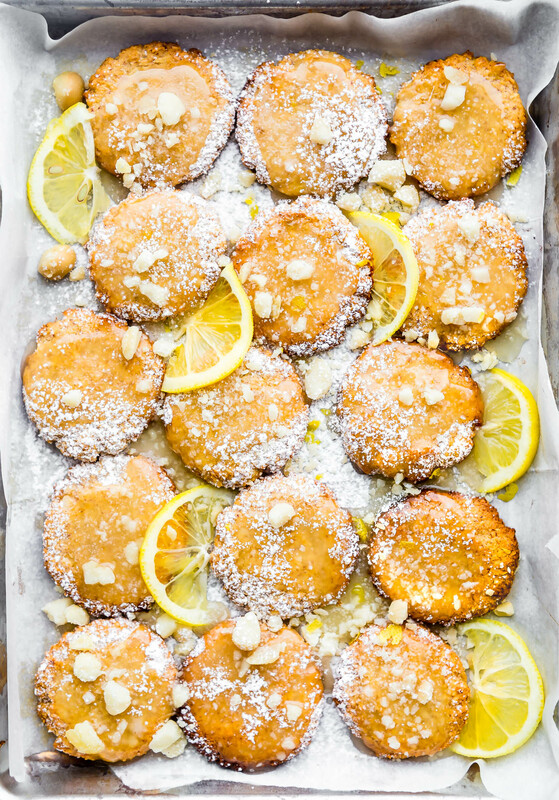 These lemon macadamia nut cookies are also seriously calling my name. I don’t have macadamia nuts too often, but when I do, they’re usually in cookies! Delicious! 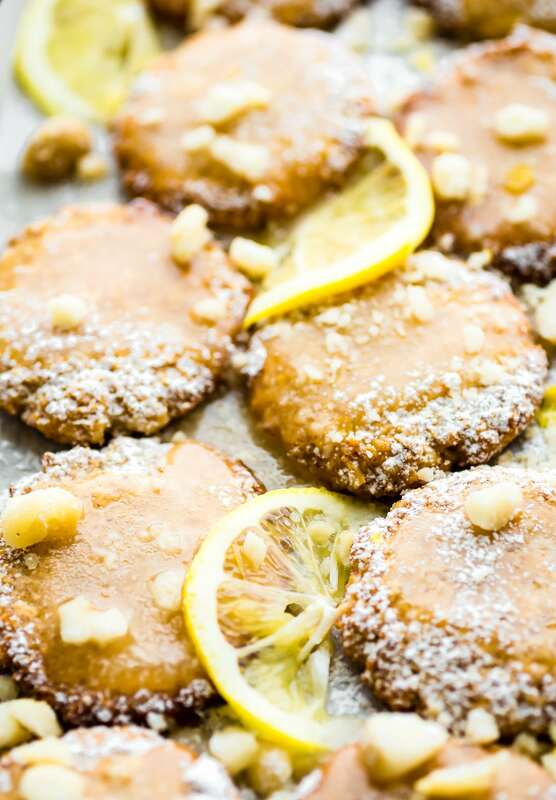 Your Lemon Macadamia Nut Cookies recipe is fantastic. I wish someone who has made these would comment! I can see for myself they look fabulous…but how did they taste and turn out for you? Sorry this is a pet peeve of mine…people who just comment on how a recipe looks not how it turned out. Totally understand! I have had several friends and blog readers make this. Along with myself. I can have them respond. I always keep the feedback in a file! But my personal tip would be to make sure your kitchen is not humid when you make the macadamia nut flour. 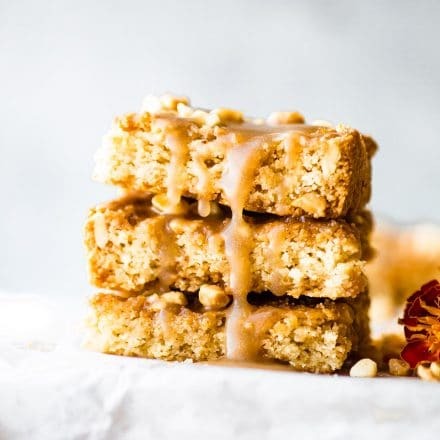 If you can’t find macadamia nuts or if you find the macadamia nuts blend into a butter versus a flour, then just substitute with more almond meal (2 cups total versus 1/1 4c). but be sure to have the batter chilled. I’ll update the notes. Does that make sense? These are amazing! Great for breakfast/snack or a treat 😉 Super simple to make too! They remind me of something from Hawaii!